Last edited by SSDriver; Jun 24th 2012 at 01:42 AM. 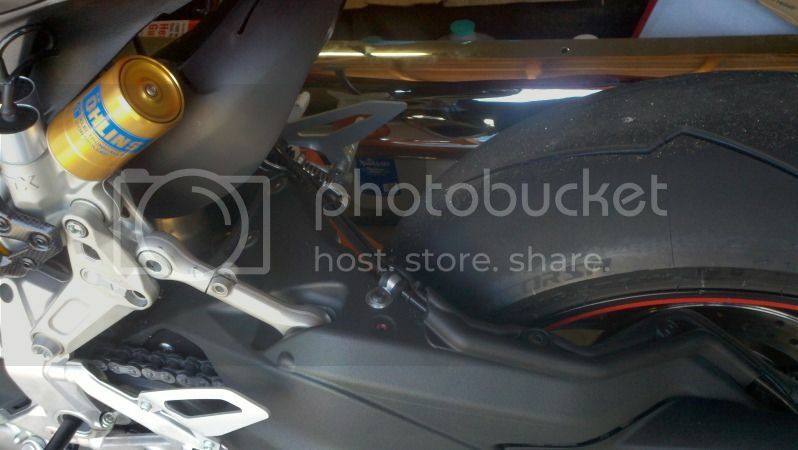 Was just looking at one of the production shots of the bike which is set to progressive. 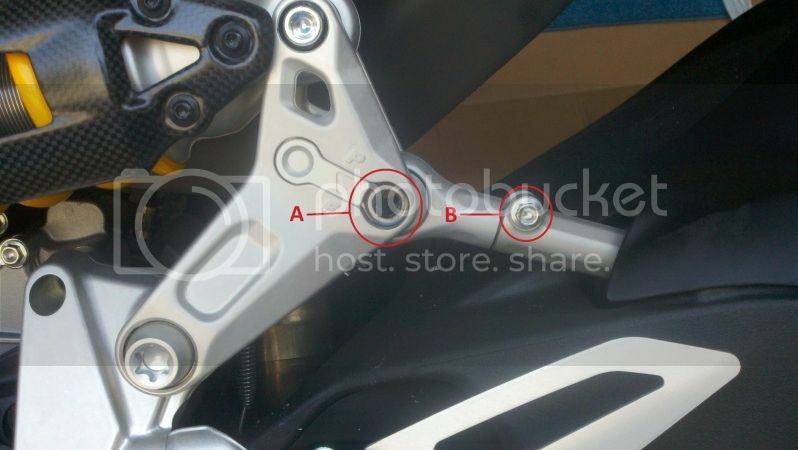 They have the linkage the other way around, so the bolt is on the bottom, and the thread is towards the rear of the bike. Can't imagine it makes a difference though, just looks maybe. Last edited by Rhino; Jun 24th 2012 at 02:18 AM. Got me wondering how mine was so just ran out to the bike and mine which is how it came from Fraser's in Sydney is exactly like the photo above. The photo of the original poster that is not the photo rhino put in. So the linkage you saw is not how they are delivering them. just glad mine came set at P and not F.
Length is the same, doesn't matter. I've seen two other bike's set up the same way I have it. It's just a push rod that you change the length on. 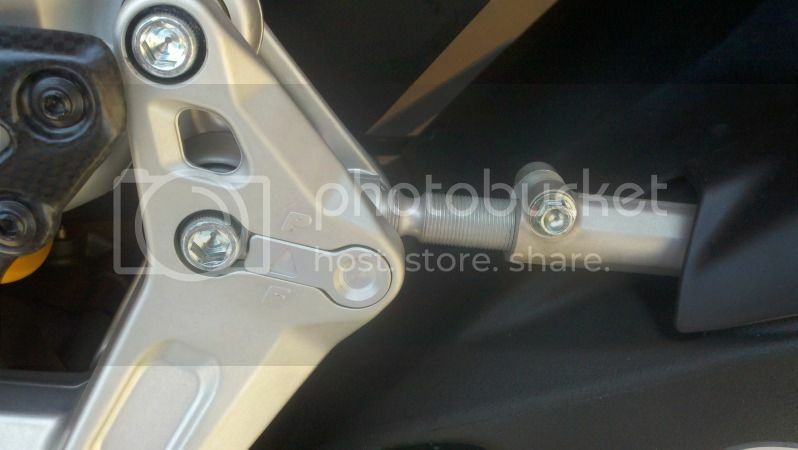 The import thing is that the push rod is going to the correct hole (forward hole) on the linkage. First put the bike on Pitbull stands. Front and back. 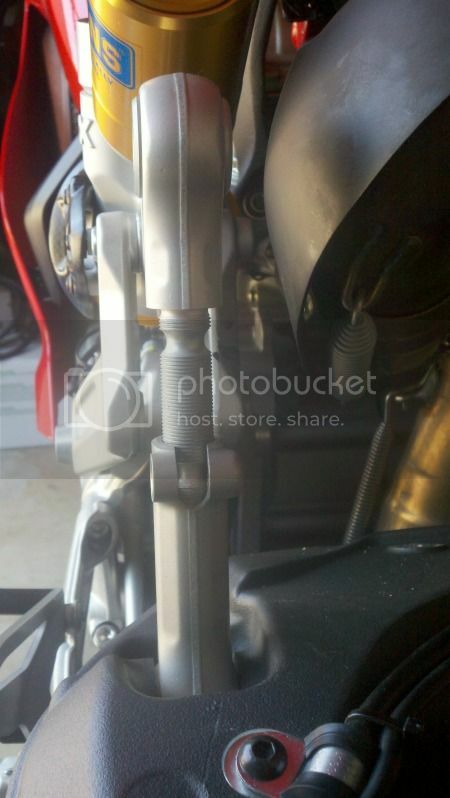 I placed a shop manual under the rear wheel so the swing arm wouldn't drop. Then I placed a hydraulic jack under the exhaust right about where the bottom cover is and a piece of wood so I would get stability and guard from damaging the cover. 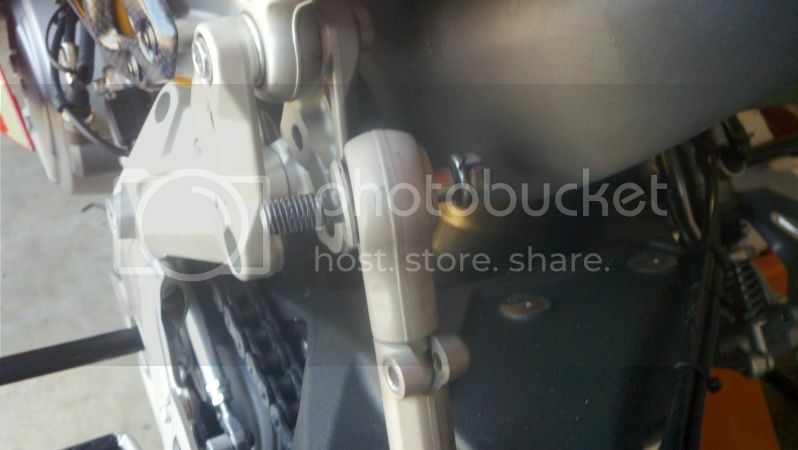 I took slight tension on the jack and loosened the control rod nut and bolt. Took out the left side hugger screw. Popped out the control rod and adjusted to the next setting. Raised and/or lowered the jack to align the control rod bolt hole. Tightened everything down and put the passenger pegs on. Took the misses for a ride and brought her home after 20mins or so. She said the seat is like a rock, lol. Seems she might need a comfort seat too! As for me, I'm impressed how a quick adjustment could change the comfort of the ride. I wanted to hang myself after riding the roads around here, pot holes and crap pavement. Now the ride seems so forgiving. A must for all riding the local streets. Super job spelling it out for everyone with list of tools a d photos buddy. There better not be another newbie post asking about this issue or procedure anymore after such detailed work that is on here now! Newbies should use the search engine for all its worth here before putting up another request for info! Really good thread my friend!! A must for all riding the local streets. Amen, brother! I hope more people read this part. just finished doing this also. 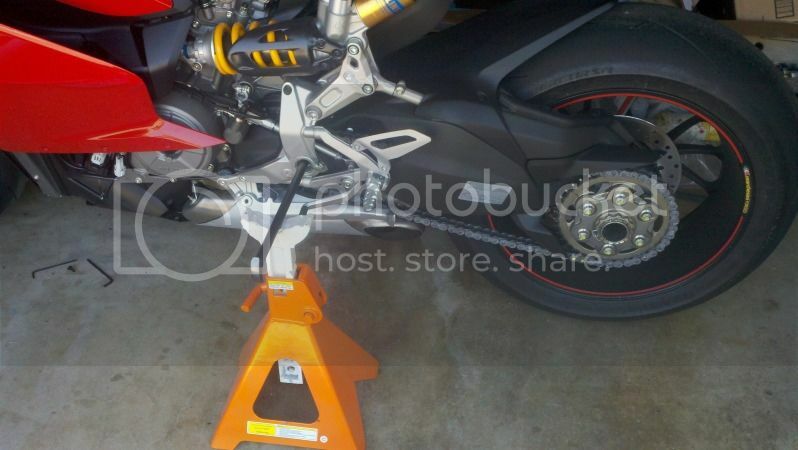 easy job, used 2 jack stands and the rear tire stand for support and to jack up the rear end to put the bike on the stands via (2) 8" 3/8" extensions. FYI mine spun freely without effort.